Edie Eckman's classic Q&A reference is better than ever! You'll find helpful answers to even more crochet questions, including new questions on broomstick lace, linked stitches, crochet cables, and much more. You'll also find illustrations for left-handed crocheters; up-to-the-minute information on new internet resources; and an expanded section on unusual techniques like Tunisian crochet. Whatever your level of expertise, you'll love having Edie Eckman's expert advice available at the turn of a page! As a self-taught crocheter, I've struggled with online resources when I need a little (or a lot of) help. From youtube, to charts, diagrams, scanned photos and drawings and everything in between, I've found the process of learning more than the basics to be hit and miss. And more often than not, frustrating. The Crochet Answer Book started out with my comfort level, in many cases very beginner, without leaving me feeling like it was doing a cursory job of being an introductory book. I never felt things were glossed over before because I "should" know them. The thing I loved most is the diagrams. The work displayed is all one colour except the bit you need to pay attention to. Clear and easy. I honestly face-palmed more than once as I realized "that's all there is to it?" 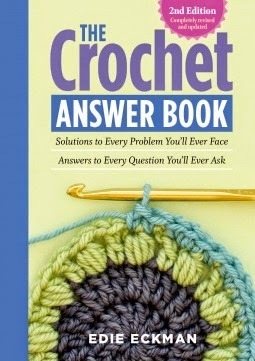 The Crochet Answer Book is a brilliant resource for any needlework library.